This cake was for my daughter’s 7th birthday and was remarkably simple in the end. I baked a plain vanilla sponge, to resemble pizza crust. I had planned to use two of my smaller tins and present them cut into pizza slices but was able to borrow a wide tin. 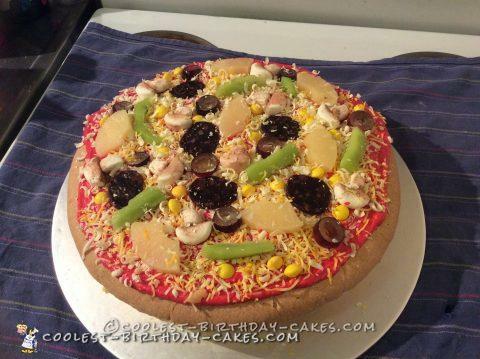 The topping were simple. Tomato sauce – red coloured butter icing (I couldn’t get a dark red colour, just ended up with a pinky red but it wasn’t noticed). Cheese was coconut threads stained with yellow food colouring and grated white chocolate. Pineapple was, well, pineapple! Green capsicum was sliced kiwi fruit. Mushrooms were simply marshmallows rubbed with cocoa powder. Salami was fruit leather (air dried fruit puree, in this case apple and boysenberry). Olives were sliced black grapes with the centre removed. Sweetcorn were yellow skittles. I had planned to make a coke can from a Swiss roll but the pizza was so big we would never eat it all! I spent very enjoyable time browsing old fashioned sweet shops to see what resembled pizza toppings- all the cooking shows say a good cook samples her offerings! Quickest birthday cake I’ve made yet.